NASA's Spitzer Space Telescope is celebrating 12 years in space with a new digital calendar. The calendar's 12 images are shown here. A NASA telescope celebrates 12 years in space over the weekend, and the agency has released a free digital calendar packed with gorgeous images to mark the occasion. The new calendar features a dozen of the best pictures captured by NASA's Spitzer Space Telescope, which blasted off on Aug. 23, 2003, and continues to observe the heavens today. 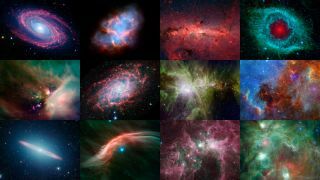 "You can't fully represent Spitzer's scientific bounty in only 12 images," Spitzer project scientist Michael Werner, of NASA's Jet Propulsion Laboratory in Pasadena, California, said in a statement. "But these gems demonstrate Spitzer's unique perspectives on both the nearest, and the most distant, objects in the universe." The sun-orbiting Spitzer was the last of four space telescopes in NASA's Great Observatories program to get off the ground. The other three were the Hubble Space Telescope(which blasted off in 1990), the Compton Gamma Ray Observatory (1991) and the Chandra X-ray Observatory (1999). Spitzer is optimized to study the universe in infrared light. Scientists have used the observatory to investigate faraway galaxies and alien planets as well as objects much closer to home, such as comets and asteroids in Earth's solar system. In 2005, Spitzer became the first telescope ever to detect light from an alien world, and the observatory recently helped confirm the existence of HD219134b, which at 21 light-years away is the nearest known rocky exoplanet to Earth. Spitzer's main mission was designed to last 2.5 years. The telescope ran out of coolant in May 2009, rendering two of its three onboard instruments unusable. However, Spitzer continues to observe the universe with its Infrared Array Camera during a "warm mission" that could conceivably last until late in this decade, NASA officials said.